Oliver Chase Quick was Canon of Newcastle, Chaplain to the Archbishop of Canterbury, and later Regius Professor of Divinity at Oxford University. Oliver Quick was the son of Robert Hebert Quick and Bertha Parr. He was educated at Harrow and Corpus Christi College, Oxford, and ordained priest in 1912. 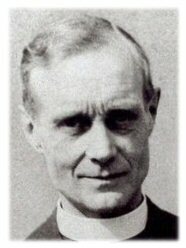 He was Canon successively of Newcastle (1920–23), Carlisle (1923–30), St. Paul's (1930–34), Durham (1934-39), and Christ Church, Oxford, 1939-44, during which time he also served as Regius Professor of Divinity. He was one of the leading exponents of orthodox Anglicanism and upheld a position similar to that of the authors of Essays Catholic and Critical (1926). He followed systematic and synthetic rather than historical methods and expressed his thought in a modern way. The Anglican Library, copyright © 2001.